Traditional welcome on arrival. Transfer to your already booked hotel. Afternoon combined sightseeing tour of Old & New Delhi. Overnight stay will be at delhi. Early morning depart for Mandawa (200 Kms / 5 Hrs). On arrival check in to hotel. Afternoon sightseeing tour of the painted & colurful havelis and many colorful Bazaars. Overnight at hotel. After breakfast drive on to Bikaner arriving in time for lunch at Lalgarh Palace hotel. 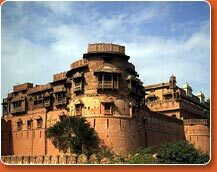 A high embattlement wall surrounds Bikaner, founded in 1488 A.D.. In the afternoon visit the fort and the palace. Overnight at hotel. After an early breakfast drive on to the ancient desert town of Jaisalmer. Afternoon walk through the cobbled streets with magnificent havelis. Overnight at hotel. In the morning visit the hilltop fort and ancient 12th century Jain temples. Evening enjoy camel ride at the Sam sand Dunes. 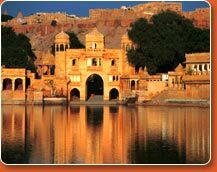 Overnight stay will be at Jaisalmer. Morning travel to Jodhpur, on the southern edge of the Thar Desert. Rao Jodha founded Jodhpur in 1459 A.D.. In the afternoon visit the magnificent 15th century fort and the Umaid Bhawan Palace the current residence of the Maharaja and also a hotel. Overnight at Jodhpur. Visit Mandore in the morning. Afternoon free to explore the narrow, bustling streets and bazaars of the old city. Overnight. Drive from Jodhpur to Udaipur, visiting enroute the temples of Ranakpur, which are the most exquisite and important Jain temples in India. 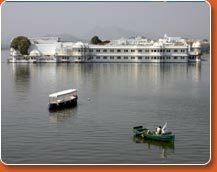 Arrive late at the Lake City of Udaipur. Overnight at hotel. Morning visit City palace that overlooks Pichoola Lake and other sightseeing's. Afternoon free. Overnight at hotel. Leave for Bundi surrounded by the Aravalli hills on three sides and is circumscribed by a massive wall with four gateways. Overnight. Morning visit the Taragarh Fort, the Palace, Chitrashala. Afternoon proceed to Jaipurto arrive in Evening. Overnight at hotel. Morning leave for Amber Fort and accent to the top on Elephant back to visit its magnificent palace and halls. Afternoon city sightseeing visiting City Palace, Museum, Observatory and the local bazaars. Overnight at hotel. After an early breakfast after that leave for Delhi. Arrive and transfer to hotel. Afternoon free for shopping activities. Late in the evening transfer to the airport for your onward destination.